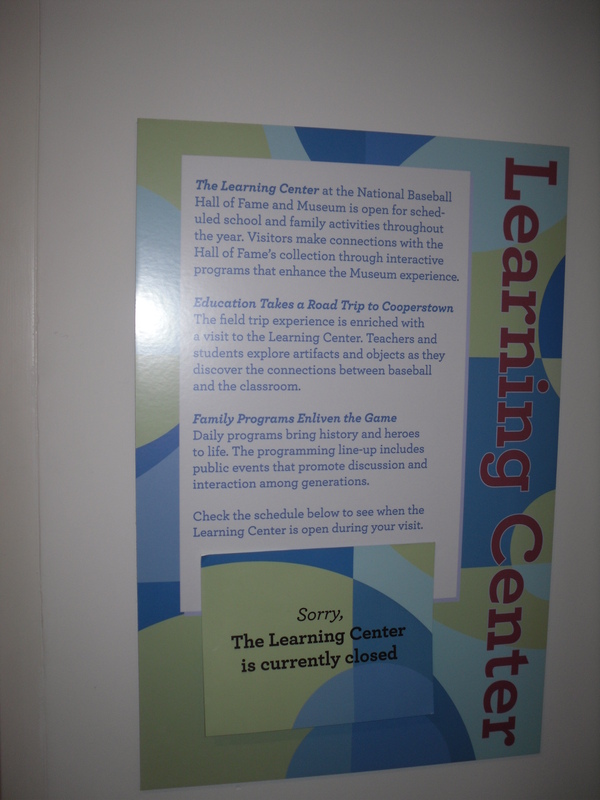 As of Induction Day, 2011, the plaque honoring Barry Halper and designating the "Halper Gallery" on the first floor of the Baseball Hall of Fame has been replaced by a sign for the HOF's "Learning Center." In that case, which was decided by a stipulation of settlement, the court transcript shows that the Judge and my attorney in the the case stated on the record that no fraud or the intent to defraud had been proven in the court proceedings. Despite that fact, in order to settle the case, which involved promissory notes I had executed to the auction house in excess of $750,000, opposing counsel demanded that an admission to fraud be made in the stipulation of settlementso that it would not be possible for me to declare bankruptcy and avoid paying the judgment rendered. The stipulation of settlement also stated that the auction house could sell my collateral consisting of baseball memorabilia to satisfy the judgement that that Mr. Healy reports as $760,000. Soon after the judgement was entered that collection of material was sold by the same auction house for over $500,000, which paid down the judgment considerably. It should also be noted that the same auction house made claims challenging the authenticity of items in that collection. Despite these claims, Rob Lifson sold the entire group of material to a collector who states that Lifson positively promoted the items and touted them as historically significant. When asked by the buyer if there were any items he could point to that were deemed inauthentic, Lifson told him he was not aware of any. The auction house also charged the buyer a premium of nearly $100,000 as a sellers fee, which was not credited against my judgement. Healey also states that I have an “outstanding warrant for (my) arrest related to the judgement” and he also included a misleading statement by Barry Halper’s son in which he refers to me as a “biased fugitive.” The said warrant is a civil (not criminal) warrant only in Somerset County, NJ, and related only to discovery and document production in the case with the auction house and the collection of their judgement. In his article Healey fails to mention the multiple investigative reports I have published on my website Haulsofshame.com and repeats false assertions in concert with statements he published from Halper’s son, Jason Halper. While Mr. Healey makes the claim that the New York Post article is a “sloppily-put together expose,” he fails to mention the original long form version of the article on Haulsofshame.com and an excerpted version on Deadspin. In fact, the New York Post contacted me with interest in the story after they read the article on Deadspin. Healey disputes that stolen items were included in the 1999 Halper sale at Sotheby’s, however, reports we have published in the past year show that many items confirmed to have been stolen from the New York Public Library and Boston Public Library were owned and sold by Halper. These items included documents from the NYPL’s Harry Wright Correspondence scrapbooks, including an 1875 letter that awarded Boston the championship, and rare photographs of the 1889 and 1892 Boston teams that were stolen from the BPL’s famous M. T. McGreevy Collection of Baseball Pictures. Many of these items are featured on our Halper Hot 100 List. Barry Halper's stolen Andrew Peck CDV (left) bears the defaced NYPL ownership stamp. The photo was found in Halper's collection after he died and was consigned to REA by his estate and widow in 2006. The FBI recovered the photo and returned it to the NYPL. The Andrew Peck cabinet photo (center) and Tommy McCarthy signed tintype (right) were also stolen from the NYPL and once part of Halper's Collection. Mr. Healey also declines to mention that in the SI.com article he references, Rob Lifson, of REA admits to having been apprehended while attempting to steal multiple rare photographs from the NYPL collection. Mr. Lifson also confessed a decade ago to this writer but gave a conflicting story about attempting to steal only one ”CDV” photograph from the library. Mr. Healey also fails to mention that Mr. Lifson was one of Barry Halper’s top sources for material and was Halper’s hand-picked consultant for the 1999 sale of his collection at Sotheby’s. Lifson also was responsible for hiring authenticators for the Sotheby’s sale and claims to have written all of the lot descriptions (including the lots that included fake, stolen and misrepresented items.) While Healey repeats the unsourced claim that I am the subject of an FBI investigation, it is Rob Lifson, along with Halper, who is another prime suspect in the FBI investigation into the thefts at the NYPL. Mr. Healey, based on a statement made to him by Halper’s son, Jason, also gives credence to claims that an 1865 letter-press document written by Alexander Joy Cartwright Jr. was not stolen from the State Archives of Hawaii. Halper writes the false claim, “Those accusations are pure nonsense.” Mr. Healey and Mr. Halper can contact the Archives in Hawaii to confirm the accurate and verifiable claim made in the New York Post. A Haulsofshame.com article about the same missing letter was published in 2010. Evidence of letters sent by the Archives of Hawaii proving that the letter was still in their collection as of 1989 have been documented and the State of Hawaii records indicate that the original 1865 letter Halper sold was never de-acquisitioned, as some have erroneously stated in the collecting community throughout the years. Chief of the archives’ historical records branch, Luella Kurkjian, confirmed the theft and noted that the letter to DeBost was “removed quite expertly.” Six pages, numbered 26-31, were removed from the letter press volume in the archive, including the three page DeBost letter. Kurkjian indicated that the apparent theft was something that might fall under the jurisdiction of Hawaii’s Attorney General. In fact, this statement published in the Post was the product of conversations with an individual quite familiar with the status of the on-going FBI investigation. When certain items were said to be replicas and not originals, he either did not sell them or he expressly relabled them as replicas without dispute. This includes the Ty Cobb, Pud Galvin, Mickey Mantle, and Babe Ruth uniforms referenced by Mr. Nash in his article. Halper fails to note that these items were never created as ”replicas,” instead, they were forgeries held out for sale as genuine. In fact, Barry Halper, publicly stated in The Sporting News and other publications his acquisition stories of these items from legendary figures like Yankee clubhouse man Pete Sheehy, the daughter of one of Babe Ruth’s teammates and a man named Ollie O’Mara, whose son today claims that Halper never purchased any uniforms from him, let alone Pud Galvin’s. The Ruth and Mantle jerseys referenced by Jason Halper were the centerpieces of the Halper Collection and featured prominently in the 1989 documentary film about Halper’s trove. 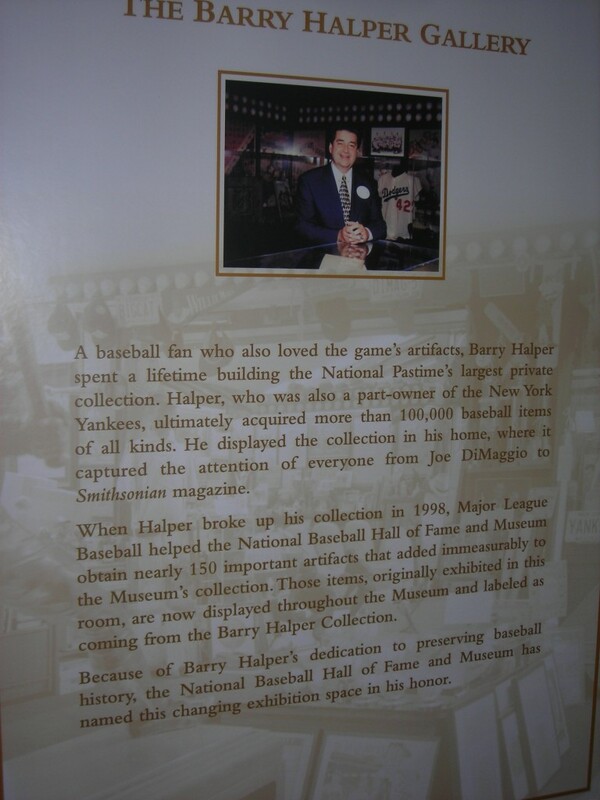 The Mickey Mantle rookie jersey was part of MLB’s multi-million dollar purchase in 1998 and was featured prominently in their official press release and in the Hall of Fame’s brochure for the Halper Gallery. Rob Lifson and REA sold the exact same jersey for Halper’s widow as a “replica” in 2007 after the Hall had returned it as a counterfeit, not a replica. When Halper sold his collection at Sotheby’s in 1999 scores of counterfeit jerseys were sold as “authentic” for hundreds of thousands of dollars. What’s Jason Halper’s response to the collectors who purchased the bogus jerseys of Hall of Famers including: John McGraw, Jimmy Collins, Hughie Jennings, Wilbert Robinson, Buck Ewing, Joe McGinnity, Ed Delahanty, Mickey Mantle, Stan Musial and others? Sadly, for Halper’s family, they are not. This writer has conducted interviews for an upcoming book that reveal the most troubling aspects of the Halper memorabilia scandal, which Healey refutes above. A descendant of a Baseball Hall of Famer has confirmed that Barry Halper did, in fact, pay one of his relatives to write a fraudulent letter of provenance for an item Halper, himself, manufactured. In addition, in an interview with a former Halper customer with close ties to the Baseball Hall of Fame, it was revealed that Barry Halper himself once bragged about being responsible for orchestrating the million-dollar thefts at the New York Public Library in the 1970’s. In the late 1970’s Halper also told the Sporting News he owned the Harry Wright correspondence collection. This plaque honoring Barry Halper no longer hangs in the Hall of Fame's vanished "Halper Gallery." Calls to Hall of Fame spokesperson Brad Horn regarding the disappearance of the Halper Gallery were not returned. Pioneering baseball historian Dorothy Seymour Mills is quite familiar with the Halper saga and the thefts from the New York Public Library. Mills helped the FBI establish the NYPL provenance of actual documents she worked with at the library in the 1950s- some of the same items that appeared and were sold by Barry Halper in his 1999 sale at Sotheby’s. Mills has reviewed much of the evidence regarding the Halper collection and its fraudulent and stolen items and has kept in touch with the FBI as their investigation into the NYPL thefts continues. Back in my day, Baseball Digest meant something. Bah! It looks like Peter has a very credible case of libel against Healey and BB Digest. Healey is the one who did the sloppy reporting. He didn’t read the court judgments. Call your lawyer, Peter, and get this moving. Offer BB Digest the opportunity to make a retraction. If they don’t do so in a timely manner, begin the libel proceedings. It seems now, that with every corner turned,there is another mystery and allegation made.It all appears that the people slinging the mud, are doing it to cover their asses. Peter, Thank you for another great installment of Haulsofshame.com. I look forward to each issue as it’s important that these frauds, thefts and deceptions are brought to light. I look forward to your book, too. I believe that your work is the most important hobby related issue of our time. I hope those de-frauded can get restitution some how. I just want you to know that I am proud to be your friend and I always wish you the best. Keep up the great work. I guess that’s why Chass no longer writes for the TIMES, what an embarassment shilling for Halper & Co. I think Joe Jackson’s wife sold Halper one of Joe’s bones and he had it surgically implanted into his body. It’s all true, Barry Halper said so. It’s a good thing that Chass doesn’t read blogs. The baseball thinkers and Baseball Think Factory would have him in tears: http://www.baseballthinkfactory.org/files/newsstand/discussion/murray_chass_on_baseball66/. Hey Murray, Stan Musial called. He said he’s still not a racist. Funny how this is the man who practically created the modern sports memorabilia industry and drove the prices of anything more than about five years old through the roof. The little of his collection that isn’t fake or stolen belongs either with the families of the baseball players or in public institutions.